Last year, two streamers, scaredpanda and Rahne, took on a very ambitious project; EVE’s very first 72-hour continuous stream: EVEathon. With over a dozen streamers involved in the project, EVEathon managed to shatter the barriers for player-driven fundraisers – a monumental task given EVE’s very charitable player base. EVEathon raised over $6,800 for the charity organization Spam4Heals – a nonprofit benefiting Broadcast4Reps and Best Of Us with a focus on suicide prevention and awareness. This year they’re at it again! EVEathon 2017 will be benefiting The AbleGamers Foundation, an established non-profit organization dedicated to bringing the wonderful world of videogames to those with disabilities. Moreover, AbleGamers has been instrumental in the lives of several EVE denizens – making them the perfect choice. In-game donations will be accepted, too, for The Angel Project : a 5 year old in-game charity with 100% of the donations supporting new player groups. From Friday, June 16th until Sunday, June 18th, scaredpanda and Rahne will be joined by Gommel Nox and other EVE Online personalities at www.twitch.tv/EVEathon for seventy-two continuous hours of Eve Online action! Everything from solo PvP, NPSI Fleets to exploration and mining – anything you’re interested in will be covered. 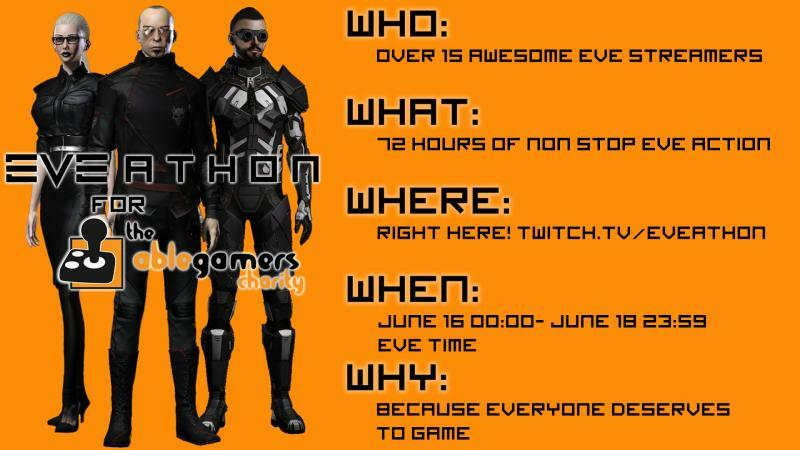 Whether you can donate in-game, out-of-game, or not at all – EVEathon would love to have you watch and spread the news. Let everyone know that, without a doubt, the game known for scams, deception, and war is still the best at being charitable. ry57x7 Thanks for sharing, this is a fantastic post.Really thank you! Cool. I cling on to listening to the newscast talk about getting free online grant applications so I have been looking around for the most excellent site to get one. Could you tell me please, where could i acquire some? Do you have a spam problem on this website; I also am a blogger, and I was wanting to know your situation; we have created some nice methods and we are looking to swap strategies with other folks, be sure to shoot me an email if interested. NLb2RX Very nice post. I just stumbled upon your blog and wanted to say that I ave truly enjoyed browsing your blog posts. In any case I will be subscribing to your rss feed and I hope you write again soon! Thanks for sharing superb informations. Your site is so cool. I’m impressed by the details that you?¦ve on this website. It reveals how nicely you understand this subject. Bookmarked this website page, will come back for more articles. You, my pal, ROCK! I found simply the info I already searched everywhere and simply could not come across. What an ideal website. Leave a Reply to News ... Click here to cancel reply.